Exon 2 contains the translation initiation codon. Exons 3 and 4 have been flanked by loxP sites (size of loxP-flanked region: 1.5 kb). The positive selection marker (Puromycin resistance - PuroR) has been flanked by FRT sites and inserted into intron 2. 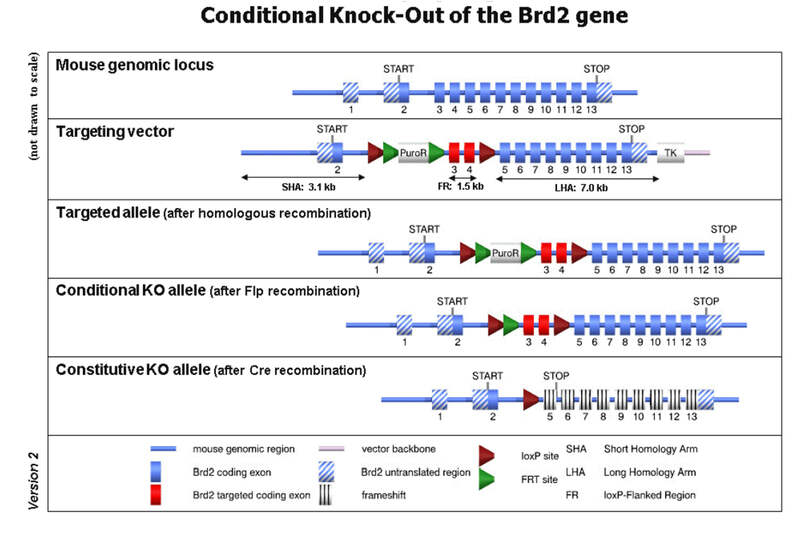 Deletion of exons 3 and 4 should result in the loss of function of the Brd2 gene by deleting most of the Bromo1 domain and by generating a frameshift from exon 2 to exons 5-10 (premature Stop codon in exon 5).